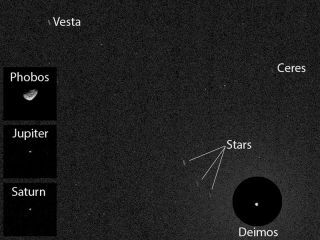 NASA's Curiosity rover snapped an image of the asteroids Ceres and Vesta while taking a shot of the Martian moon Deimos on April 20, 2014 PDT. In other images from that photo session, Curiosity also captured Mars' other moon, Phobos, and the planets Jupiter and Saturn. NASA's Mars rover Curiosity has captured the first image of asteroids as seen from the surface of the Red Planet. Curiosity's historic asteroid picture of the Martian sky shows Ceres and Vesta, the two biggest space rocks in the solar system's asteroid belt between Mars and Jupiter. These objects would be bright enough to be visible to a person with normal eyesight standing on the Red Planet, NASA officials wrote in an image description. The brightest object in this image, taken by NASA's Curiosity rover, is the Martian moon Deimos. The asteroids Ceres and Vesta appear as short faint streaks in the upper half of the image, which marks the first time that asteroids have been photographed from the Martian surface. "This imaging was part of an experiment checking the opacity of the atmosphere at night in Curiosity's location on Mars, where water-ice clouds and hazes develop during this season," camera team member Mark Lemmon, of Texas A&M University, said in a statement. "The two Martian moons were the main targets that night, but we chose a time when one of the moons was near Ceres and Vesta in the sky." With a diameter of about 590 miles (950 kilometers), Ceres is by far the largest object in the asteroid belt. The spherically shaped body was the first asteroid to be discovered (by Giuseppe Piazzi in 1801) and it is actually considered a dwarf planet now. Vesta, meanwhile, measures 350 miles (563 kilometers) wide and ranks as the third largest object in the asteroid belt, though it is the second-most massive. It has dark and light patches much like Earth's moon, and chunks of the asteroid have broken off and slammed into Earth as meteorites. From an Earthling's point of view, Vesta is the brightest asteroid in the sky, sometimes visible to the naked eye. NASA's Dawn mission orbited Vesta in 2011 and 2012, capturing detailed images of the asteroid's lumpy, pockmarked surface. The spacecraft will enter into orbit around Ceres next year. Curiosity is the heart of NASA's $2.5 billion Mars Science Laboratory mission. The 1-ton, 6-wheeled robot landed on the Red Planet in August 2012 to look for evidence of Mars' warmer, wetter past. The rover is currently driving toward Mount Sharp, a mountain that rises 3 miles (5 kilometers) from the center of Gale Crater.